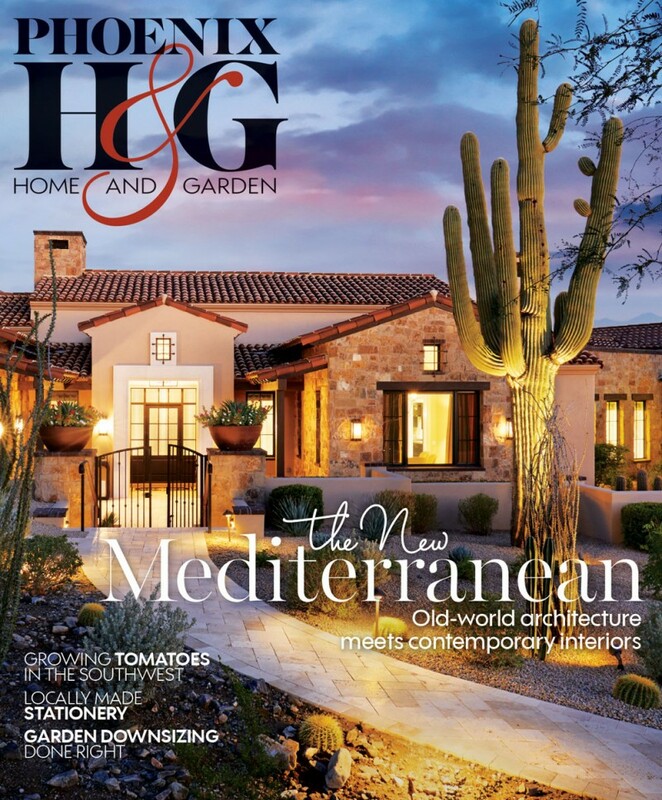 Architect Scott Carson designed the nearly 6,200-square-foot Mediterranean-influenced home that, while expansive, doesn’t appear as a linear mass upon approach. “From the exterior, there’s a lot of character and movement. 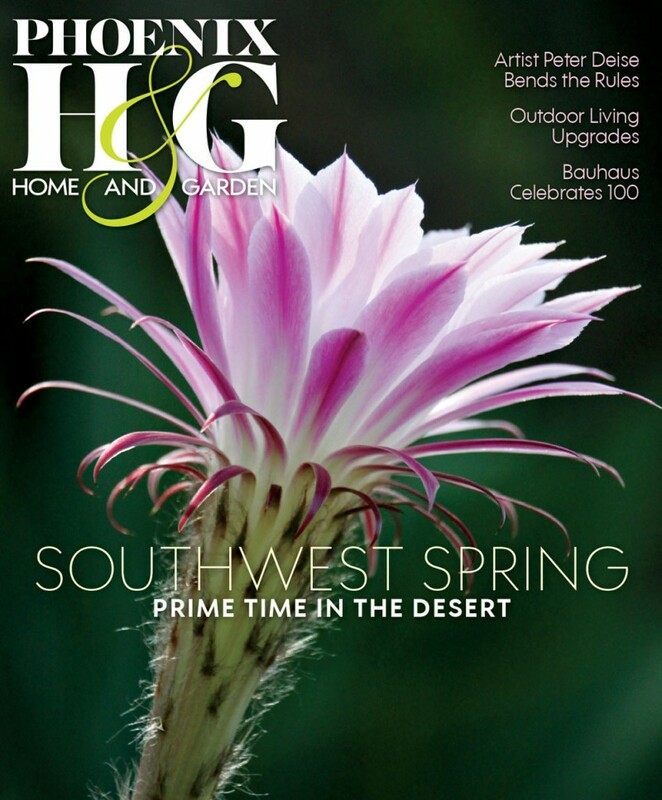 So you read the house at different vantage points, and it doesn’t look as large as it is,” he notes. A classical facade opens to chic, contemporary living spaces. The new house snuggles comfortably into its surroundings. 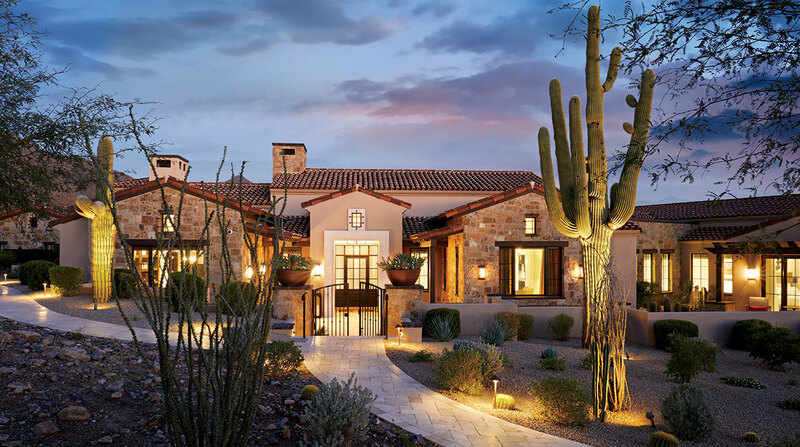 With the rugged peaks of the McDowell Mountains rising majestically behind it, the Mediterranean-influenced residence of Jeff and Karen Stratton sits low amid cacti and ironwood trees, and—aesthetically speaking—converses easily with similar Old World-style houses on the street. 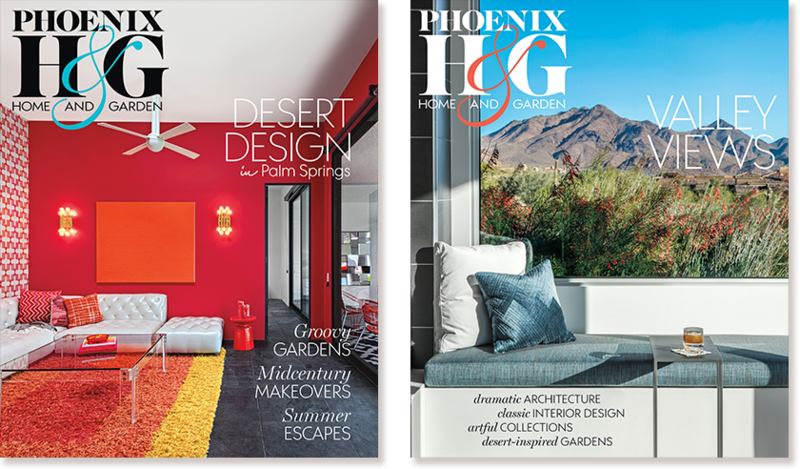 The home’s Chicago-based owners combined two high-level executive careers with raising a family, spending time with friends and taking sojourns to play golf and relax in Scottsdale. They owned various vacation retreats here but maintained their home address in the Midwest. That changed a few years ago when Jeff eased back on his busy work schedule and the couple decided that it was time to find that perfect piece of property and build their first “from the ground up” home—as they put it. 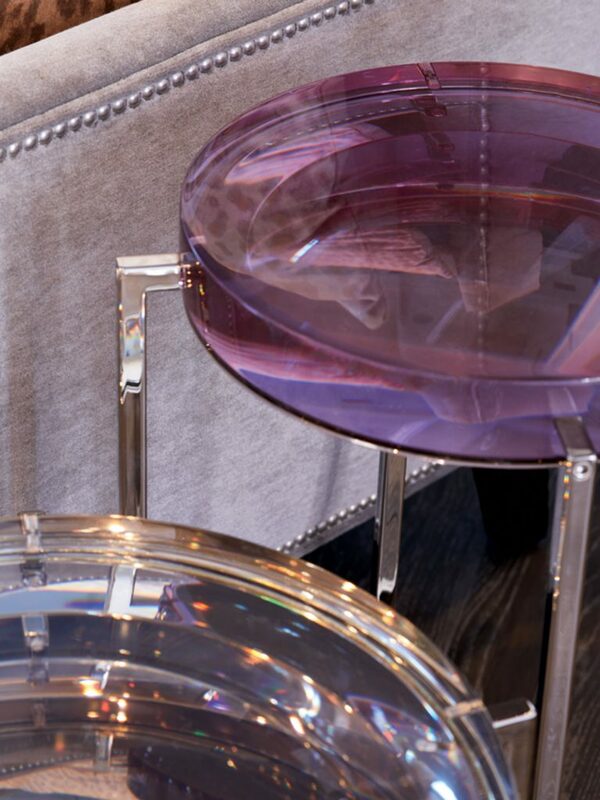 Two jewel-toned lens tables, in purple and translucent pale gray, catch the light in the family room and are some of interior designer Lauren Rautbord’s favorite pieces in the home. “They were a bit of a splurge, but they’re like pieces of art,” she says. The couple enlisted architect Scott Carson and builder Steve Sommer to envision and execute their ideal design, with primary requests including maximizing those amazing views, creating a flexible floor plan, incorporating resortlike amenities and striking a balance between comfort and glamorous style. The Strattons’ idea of a flexible layout was one that wouldn’t make the house feel too large when just the two of them were in town, but that was still big enough to welcome their three Illinois-based children and six grandkids for family get-togethers. Karen’s elderly father is also a frequent visitor; he even met with the design team to lend input on the look and function of the home, making it a place that four generations can enjoy together. 1. 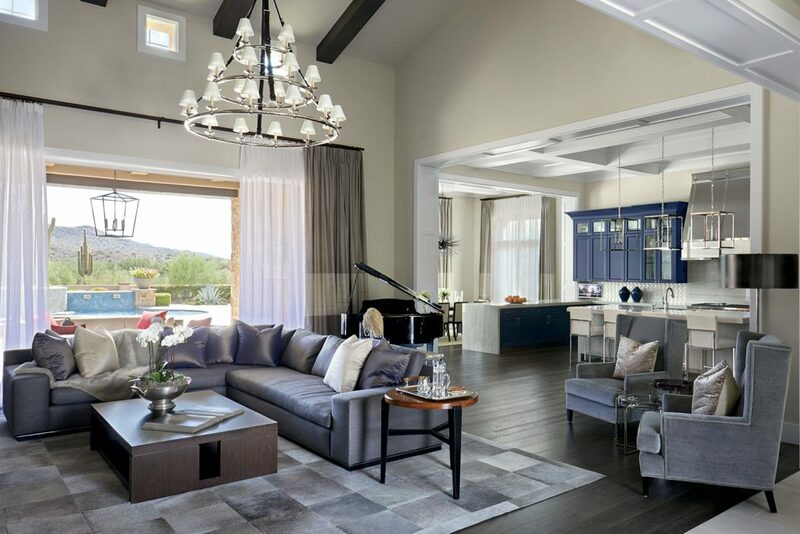 The soaring, beamed ceiling above the family room reflects the grandeur of the mountains beyond, while light streams through clerestory windows, glinting off the many reflective surfaces used throughout. A sleek sectional with nailhead trim next to a low, square coffee table is where homeowners Jeff and Karen Stratton love to gather with their grandchildren to assemble jigsaw puzzles. “We wanted a space that looks nice but is comfortable,” says Karen. “We had to be able to live in it and have the young ones run around and enjoy themselves.” 2. 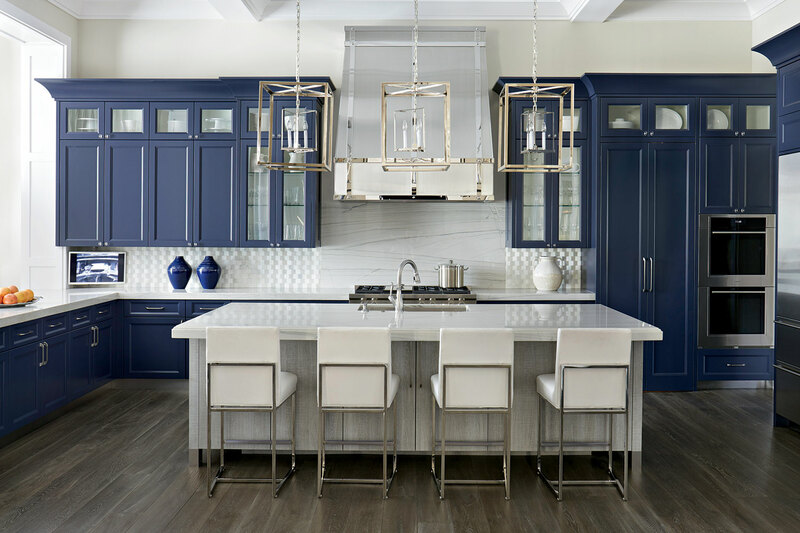 With its fresh blue-and-white color palette, the bright kitchen is traditional with a dose of shimmering sophistication. The tall pantry cabinet to the left of the stove hides a secret: The doors bi-fold inward to reveal a large walk-in storeroom that not only hides excess provisions but is also likely a popular spot for the Strattons’ grandkids to play hide-and-seek. 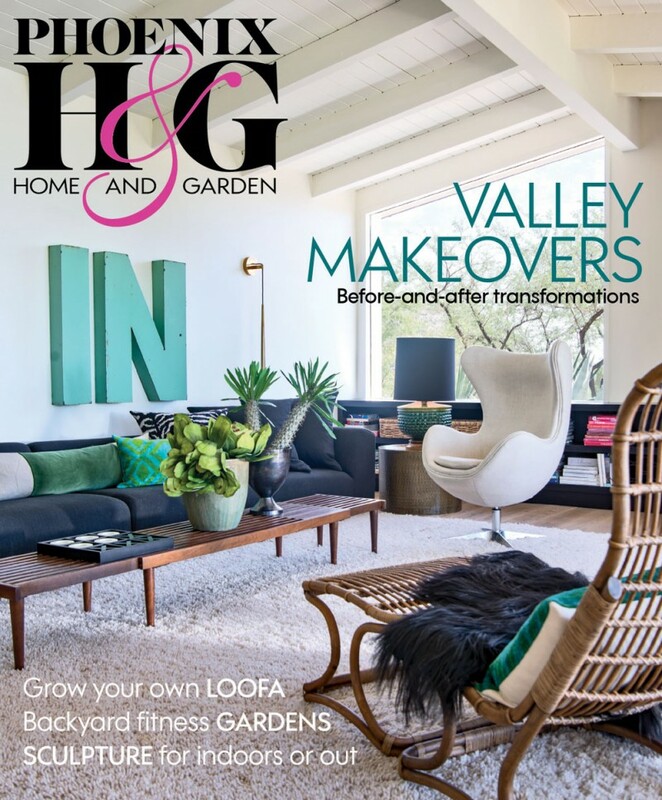 To that end, the heart of the home visually and physically is the great room. A few steps from the front door and entry hallway, it encompasses a large, sophisticated family room that opens to those all-important vistas and outside living spaces, a gorgeous kitchen with bejeweled accents and a handsome breakfast room. It also separates the home’s two wings. Carson designed the residence with separate bedroom areas. The owners’ side functions much like Jeff and Karen’s downtown Chicago condo. Everything is at their fingertips: Their master suite is adjacent to the great room, steps away from their shared office, and even includes a separate, small laundry area built into their spacious his-and-hers closet. Rautbord’s design for the kitchen exemplifies this approach and started with an eye-catching stainless-steel range hood. Combining both matte and polished metal, the hood inspired the choice of pendants that repeat its shape without obstructing its view. Dark blue-stained cabinets complement the metallic touches. 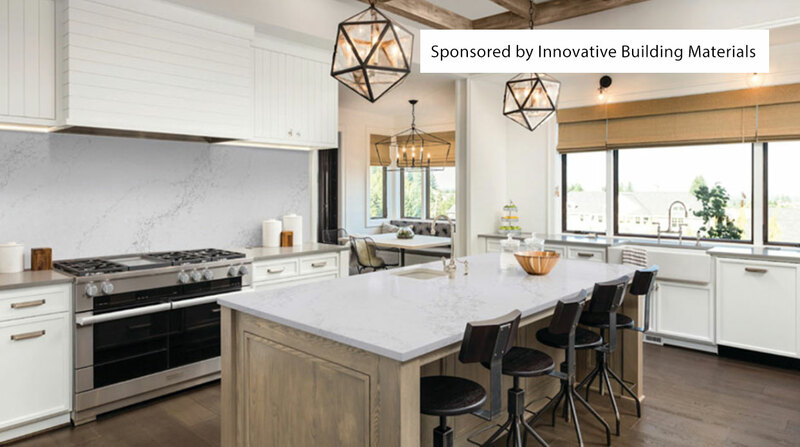 Other singular accents that are subtle but add greatly to the overall look include stainless steel baseboards; a raised, geometric tile backsplash that implies movement; and a distressed wood island base. “We wanted to keep a bit of rustic feel, but the materials aren’t ‘desert rustic,’” the designer explains. While this kitchen has plenty of finesse, it’s also hardworking. “It’s all very sturdy, and I think the space will stand up to lots of use when Jeff and Karen’s grandchildren are in town,” she adds. 1. 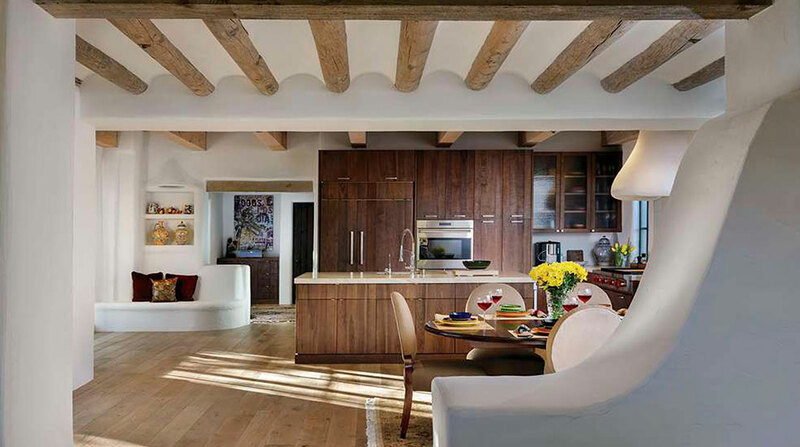 The dining room’s vaulted ceiling was inspired by builder Steve Sommer’s own home. “We visited Steve’s house and really loved the variety of ceiling styles he had. We told him we wanted something similar,” says Jeff. A muted color palette and elegant silhouettes, accented by a simple crystal-and-iron chandelier, allow the architecture and views to shine. 2. 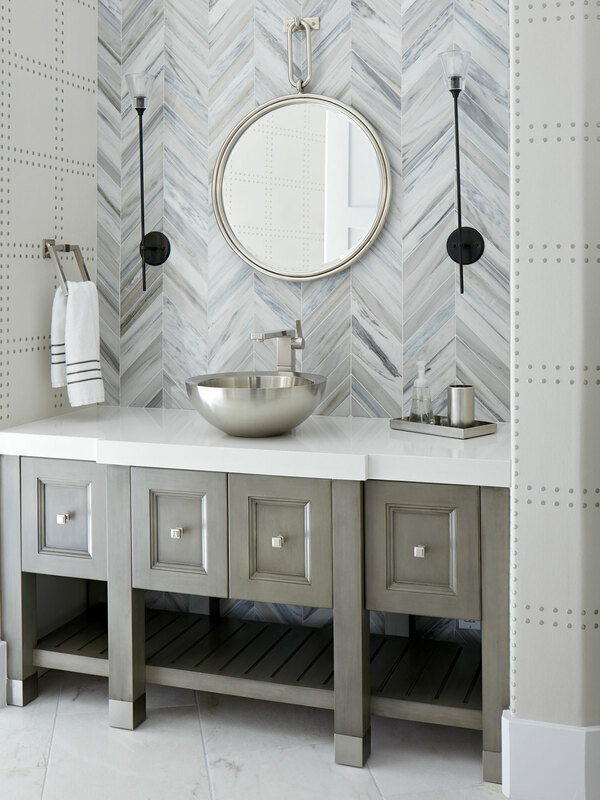 The powder room has direct access to the backyard pool, but it is by no means a dull pass-through thanks to nailhead-patterned wallpaper and chevron backsplash. The room is sleek enough for guests yet can hold up to messy grandkids after a long day of swimming and outdoor play. 3. The couple’s shared office is lit from above by a burnished brass chandelier with glass globes, a playful twist in an otherwise traditional room. 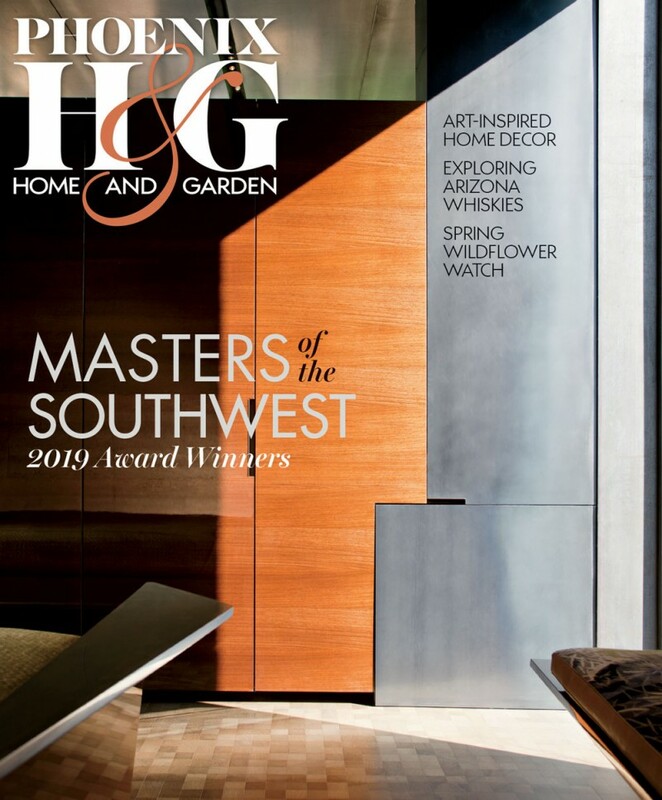 The kitchen is connected to the guest wing by a long gallery hallway lined with windows that showcases the couple’s art collection, which Rautbord had reframed to fit the style of the home. The windows look out to a serene guest courtyard with an architectural fountain of basalt stone. Accessible from both bedroom wings, the pool deck—and the entire yard, which backs up to an open wash—offers that resort feel that the Strattons desired, with an adjacent putting green, spa and outdoor shower, and a dining cabana with unparalleled views of the McDowells beyond. A circular fire pit was strategically placed in the center of it all, allowing the couple to keep an eye on the grandkids while also being able to maintain a conversation with folks who are dining or relaxing in the landscape’s many sitting areas. After an evening spent outdoors, the Strattons can retire to their luxurious master suite. The room isn’t especially large, but it is full of visual and tactile contrast, from the billowy drapes and plush linens to the tailored seating area. Smoked mirrors that line the wall behind the upholstered headboard reflect the crystal chandelier and textured stone fireplace. Just across the hall from the bedroom is Jeff and Karen’s shared office. Its decor would look at home in a Michigan Avenue high-rise—sans the saguaro that’s just outside a large window. The space has substantial floor-to-ceiling bookcases that display memorabilia, family photos and books; walls covered in soft tan suede; animal-print carpet on the floor; and a traditional tufted wingback in the corner. A well-equipped bar cart gives the impression that a classy cocktail session could break up the monotony of work if the whim strikes. At first glance, the Stratton residence maybe be mistaken for just another Mediterranean-style abode. But once past its pretty courtyard garden and through the front door, a well-planned, -executed and -loved contemporary American family home is revealed. 1. Jeff and Karen love to unwind on one of the home’s many patios. Their favorite spot to watch TV or host guests is the outdoor living room, located off the great room. Every weather eventuality was considered during its design. Retractable screens on all sides can be lowered and a misting system activated when it’s hot, while recessed heaters in the ceilings warm the space on chilly nights. Fire features on each side of the pool, as well as an adjacent fire pit, add to the evening ambiance. 2. 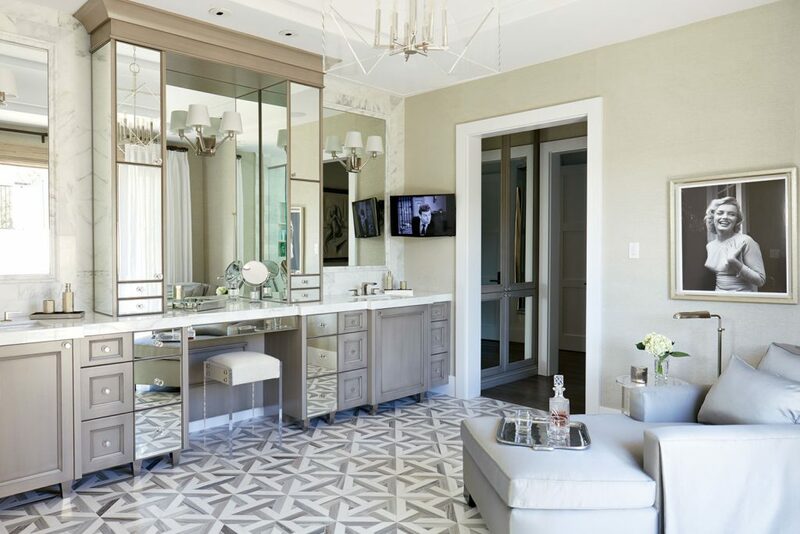 The master bath provides a modicum of Hollywood glam with mirrored vanities reflecting the light that streams in from the adjacent private, bougainvillea-draped patio. While plumbing for a bathtub was included in the design and remains for future use, the Strattons nixed a tub and opted for an oversized shower and chaise lounge. 3. The master bedroom is a case study of comfortable luxury. The textured stone fireplace, plush furnishings, elegant drapery and smoky mirrors provide visual interest without being overwhelming. “I love the amount of natural lighting we were able to get into the home through proper sizing and placement of windows,” says builder Steve Sommer.